North East Memorials supplies a large range of bronze, aluminium and granite stone plaques for memorials and cremation. Made to order to your specific needs and cemetery specifications. Granite and Concrete base blocks are available for your plaque to be mounted on. Talk to our staff today to discuss your individual needs. Bronze Plaques can come in a range of different designs and shapes. These can include religious images, natural landscapes, flora & fauna and much more. Plaques can also be painted to your colour of choice. 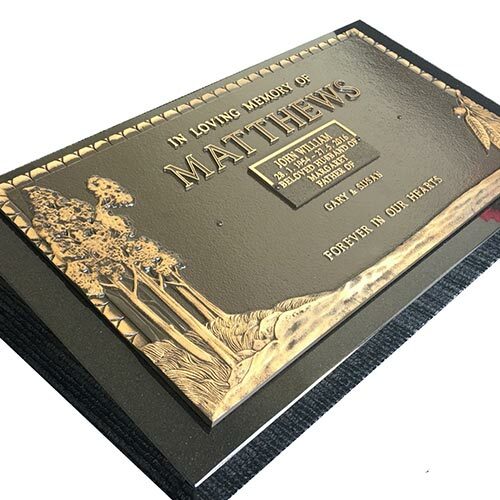 All Bronze plaques are finished with a Diamond Shield™ Finish which give them increased longevity in outdoor conditions. If you have a plaque that is faded and looking worse for wear, contact our staff to dicuss the options available to you. View more plaques by visiting our gallery!